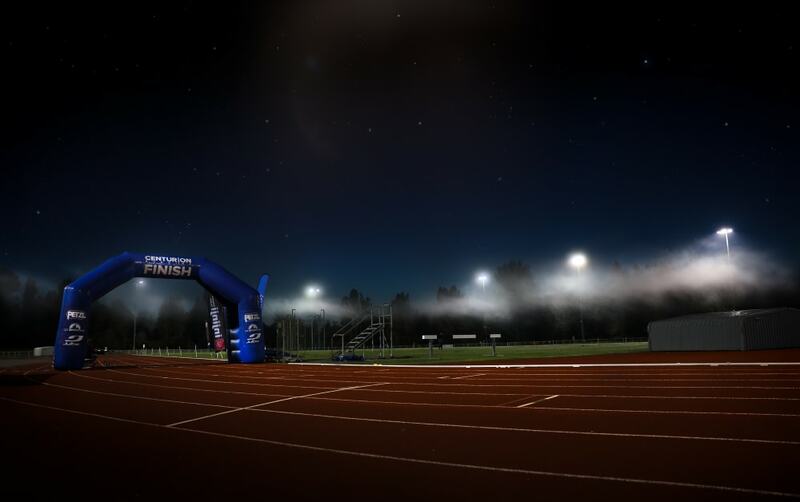 The Centurion Track 100 is an elite level event, designed for runners to compete under the fastest possible conditions and with a focus on record setting. The race is for the 100 mile distance only and a 17 hour cut off will be in place for all runners. This race follows in the footsteps of some of the classic events seen during the 1970s and 1980s when many of the fastest British 100 mile times were set. A full list of the All Time top British 100 mile performances for both men and women can be found via the stats page here. The course will be officially measured and certified under UKA standards, be overseen by a UKA referee and hold a UKA permit. The race takes place on the track at the Julie Rose Stadium in Ashford. Runners will begin at 0600 on Saturday 7th September 2019 and the total cut off for all runners will be 17 hours or 2300. Runners will run in Lane 1,2 and 3 with race official check point and any crews to be set up in Lanes 4-8. Runners are permitted and encouraged to bring a crew, each crew will be able to set up in Lane 4 and tend to their runners as often as they wish but crews must remain completely stationary when handing anything to or communicating with a runner. Spectators are welcome and encouraged for the duration of this event. This event is by invitation or qualification only - see below. Entry is limited to 30 runners total in anticipation of 20 starters. The field is set small to create conditions for the optimal distance travelled for all runners. Entries are first come first served and any application will be accepted or refused within a week of our receiving it. Once we have received 20 appliations, we will tighten the criteria for entry. Runners meeting one of the listed qualifying standards may apply for acceptance into the race. The entry fee applies to all runners, regardless of qualification time. The course is a 400 metre all weather track at Julie Rose Stadium, Ashford in Kent. Runners will change direction every 3 hours, with the final change occuring at 15 hours elapsed - for the last 2 hours only (cut off 17 hours). Electronic Timing at the start finish line together with back-up timing at one additional point per lap. Weather in the UK can be variable at the best of times but we have picked early september as offering optimum potential for dry and moderate temperatures, with long daylight hours. Runners should prepare for all conditions on the day. The track is well shielded from the wind by a very large grand stand down one side, and is protected by banking on the near bend. Runners will each be permitted a sizeable crew area from which they may be tended to. There will be a full aid station providing an extensive range of food and drinks to all runners for the duration of the event. Crews will also be able to access both fluids and food for their runners. All runners will have their 100 mile split recorded. Runners stopping before 100 miles will be recorded as DNFs due to the fact that this is a distance race and not a timed event.